Concur is described as a suite of a travel and expense management software that makes booking business travel, managing travel cost, and liquidating or billing the expenses an easy task to handle. Both small and Fortune 500 corporations are using the app and make it as their official travel tool. Additionally, the app has four major modules: Concur Travel, Concur Expense, Concur for Mobile, and Concur Invoice. Concur Travel features a customized planning tool for your trips, which allows your managers to approve or disapprove the requested adjustment. This module provides a broad inventory of global travel distribution system, including web-based fares and negotiated pricing. Also, you can get 25 reporting templates so you can document the travel spent by your employee more conveniently. Concur Expense will make it easy and fast for you to monitor, analyze and report the expenses in a trip. You can record and approve the expenses instantly by taking images of the receipts. It can even incorporate electronic receipts of the expenses, as well as purchases using credit cards. 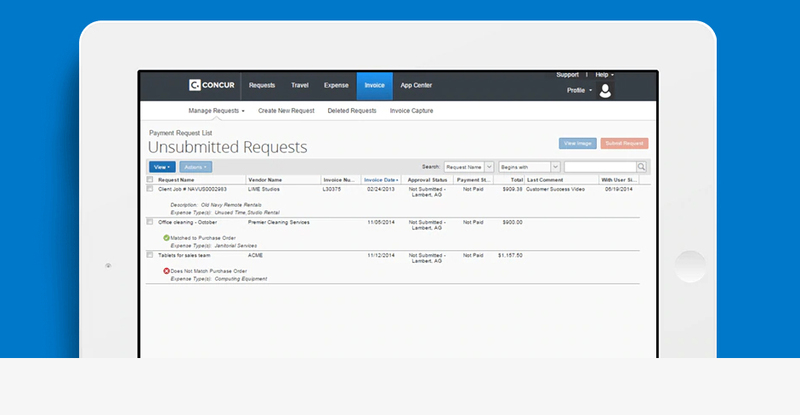 Also, Concur Expense can integrate with your ERP data so you can consolidate your budget and expenditures better. Concur Invoice, on the other hand, offers dynamic options so you can match your purchases and invoices with requisition workflows. This module helps you to manage your orders and deliverable faster so you can have control over strict vendor compliance. This features the automated vendor payments, like checks, credit cards, and ACH. It also has a supplier self-portal that allows vendors to verify payments and invoices. Lastly, Concur for Mobile allows you to take advantage of all features of the software using your mobile devices, including Windows Phone, Blackberry, Android, and iOS. Concur makes it easy to approve or disapprove expenses via manager access. You can also take pictures of expense receipts or book your travel from anywhere, any time. Meanwhile, it helps you create reports using receipts or create your expenses report with the help of 25 templates. The app provides safe online transactions using remote wipe capabilities and data encryption. It also has a broad inventory of travel suppliers. These data are available and easily integrated into your accounting software or ERP to process your budget or expense faster. Likewise, the software can incorporate electronic receipts of airlines, restaurants, hotels, and transportation providers, allowing you to save time on expense reporting and supports automated vendor payments, like checks, credit cards, and ACH. It also has a supplier self-portal that allows vendors to check payments and invoices. Concur is also accessible via mobile.